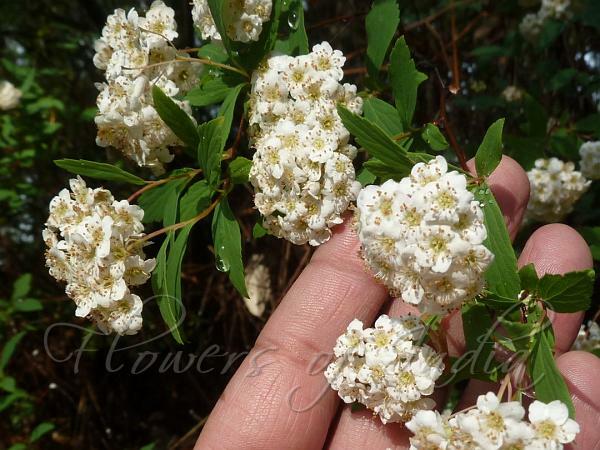 Reeves' spirea is a deciduous or semievergreen little shrub with very showy clusters of white flowers in midspring. This spirea gets 3-6 ft tall and the wiry, reddish brown, gracefully arching stems can cover an area 6-8 ft across. The leaves are about 2 inches long, dark green on top, pale blue green beneath, and diamond shaped with toothed margins. The small roselike flowers, 1.2 cm across, have five (or many) white petals and are borne in round clusters about 5.1 cm across and are profusely distributed all over the bush. 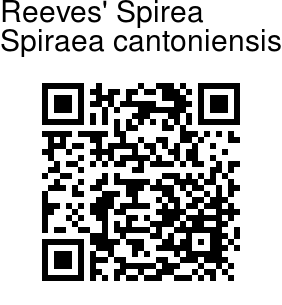 Reeves' spirea is native to China. Photographed in Ranikhet, Uttarakhand & Pahalgam, Kashmir.